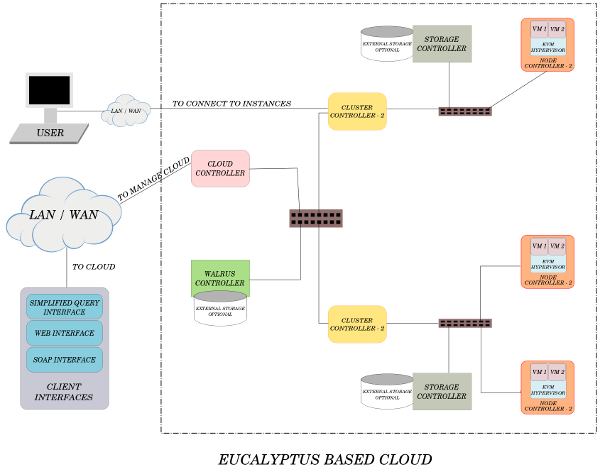 Eucalyptus is an open source Linux based software architecture which provides an EC2-compatible cloud computing platform and S3-compatible cloud storage platform. It implements scalable, efficient-enhancing and private and hybrid clouds within and organization’s IT infrastructure. It gives an Infrastructure as a Service (IaaS) solution. Users can use commodity hardware. Eucalyptus was developed to support the high performance computing (HPC). Eucalyptus can be deployed without modification on all major Linux OS distributions, including Ubuntu, RHEL/CentOS, openSUSE, and Debian. For implementing, managing and maintaining the virtual machines, network and storage Eucalyptus has variety of features. 1. Cluster Controller (CC) Cluster Controller manages the one or more Node controller and responsible for deploying and managing instances on them. It communicates with Node Controller and Cloud Controller simultaneously. CC also manages the networking for the running instances under certain types of networking modes available in Eucalyptus. 2. Cloud Controller (CLC) Cloud Controller is front end for the entire ecosystem. CLC provides an Amazon EC2/S3 compliant web services interface to the client tools on one side and interacts with the rest of the components of the Eucalyptus infrastructure on the other side. 3. Node Controller (NC) It is the basic component for Nodes. Node controller maintains the life cycle of the instances running on each nodes. Node Controller interacts with the OS, hypervisor and the Cluster Controller simultaneously. 4. 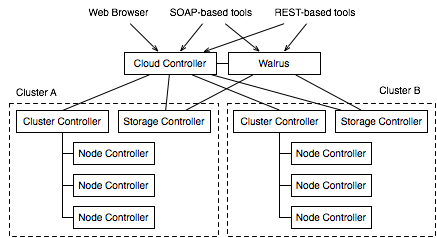 Walrus Storage Controller (WS3) Walrus Storage Controller is a simple file storage system. WS3 stores the the machine images and snapshots. It also stores and serves files using S3 APIs. 5. Storage Controller (SC) Allows the creation of snapshots of volumes. It provides persistent block storage over AoE or iSCSI to the instances. i need to know in what format and how data flow in eucalyptus components? Thanks for sharing the post related to S3 Compatible Storage which is highly informative. S3 Compatible Storage enables service providers and enterprises to build reliable, affordable and scalable cloud storage solutions. Please share if you have some more info.